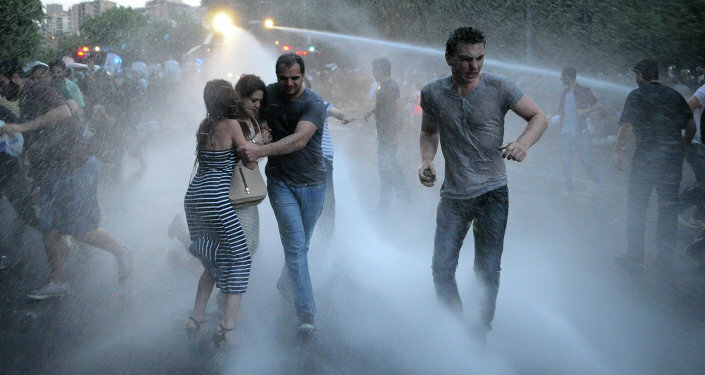 The events in Yerevan are turning into a Color Revolution, believes Sputnik columnist Andrew Korybko. Armenians have taken to the streets to protest a planned 17-22% increase in their utility bills, initiated by the Armenian Electricity Network due to the Armenian dram's dramatic depreciation over the past year (about equal in percentage to the price hike itself). While it's understandable that some in the economically struggling country would be upset by the $85 or so cumulative increase in payments each year, many find it troubling that some individuals have resorted to arming themselves and aggressively attacking the police, and it's confusing that the participants would reject government appeals to negotiate if all they were really after was to repeal the electricity rate increase. After hundreds of arrests over the past few days for hooligan activity, groups of individuals are now blockading the capital's main avenue and have threatened to march on the Presidential Palace, eerily following in the footsteps of their EuroMaidan predecessors. More and more, what may have begun as a legitimate protest movement appears to have been hijacked into a Color Revolution attempt. Opposition to the electricity rate increase had been brewing since May, but it was only on Monday that the "No to Plunder" initiative was able to bring thousands to the streets in protest. They gathered on Freedom Square, in the city's center, and demanded that the hike be reversed. President Serzh Sargsyan suggested that they choose five representatives to speak to him about it, but the mob refused. Later that night, internal provocateurs pushed the crowd into marching on the Presidential Palace, and when they refused law enforcement's repeated pleas to disperse their illegal manifestation, the riot police were forced to resort to water cannons and mass arrests to restore public order. The resulting tumult injured 11 police officers and 7 protesters, and some of the 237 who were arrested were reported to have been equipped with knives, knuckle dusters, batons, and metal rods. "…we are concerned about reports of excessive police use of force to disperse the crowd on the morning of June 23, as well as several reports of abuse while in police custody. In addition, we are troubled by reports that journalists and their equipment were specifically targeted during the operation. It is imperative that the Government conduct a full and transparent investigation of reports of the excessive use of force by the police to the full extent of Armenian law." Just like in Ukraine, when the US supports an anti-government movement (which is what has essentially formed in Armenia), it completely opposes any attempt by the authorities to assert law and order in responding to their proxies' illegal provocations. The implicit statement of support for the disorderly activity was a signal to the Yerevan organizers to stage an occupation movement on Baghramyan Avenue, the central street leading to the Presidential Palace, and block it with a combination of garbage cans and a "living wall" on Wednesday. The Minister of Education and a few opposition MPs physically partook in this activity, indicating an emerging split within the government. The individuals behind the destabilization have since branded their movement ‘Electric Yerevan', and this was a sign for their affiliated anti-government cells all across the country to simultaneously ‘come out' and transform the capital's protests into a nationwide rebellion. The coordinated nature of ‘Electric Yerevan' and its disturbing similarities to EuroMaidan indicate that it's turned into a Color Revolution. All such regime change attempts need an event to galvanize the public and provide a front opportunity for carrying out their coup activities, and the unpopular increase in electricity tariffs fulfilled this basic requirement. Since there's an element of genuine protest involved, it creates a plausibly deniable cover under which to operate among a swarm of thousands of de-facto human shield protesters, which is yet another shared element it has with EuroMaidan. But the similarities don't stop there, since ‘Electric Yerevan' also involves a covert organizing network dedicated to regime change as well. In early June, a shadowy organization called "Civic Contract" was finally inaugurated as an official political party in the country. The group is led by Nikol Pashinyan, an opposition member previously convicted of organizing mass disorders, who confidently proclaimed during his party's founding congress that "We are setting up a party that does not intend to be in opposition for long and expects to assume power in the Republic of Armenia in the foreseeable future by gaining a popular vote of confidence", and that "Our hope is the youth, we are here to open the way to the future for young people." Part of his party's appeal to this targeted demographic may lay in the fact that it's a nihilistic organization that's seemingly against everything (both the government and the present opposition), but it doesn't say what it supports. It supposedly plans to unveil a platform closer to the 2017 parliamentary elections, but until then, it functions as an attractive magnet for all sorts of disenchanted individuals, no matter their complaints. This makes it a capable force in organizing anti-government activity, which has evidently been proven by the large-scale disturbances seen in recent days. Pashinyan has become the most visible face of ‘Electric Yerevan'. He's shuffled between numerous police stations to press for the release of his jailed supporters and he continuously offers comments to the media. In fact, he was the one who ordered that a ‘human wall' be created and that "all former and current MPs, scholars, show-biz representatives, lawyers, reporters, religious representatives and other public figures to visit the standoff site." Keeping in mind his party's stated vision of quickly rising to power, it's expected that he'll press the Civic Contract-influenced mob to demand early elections before their scheduled 2017 and 2018 dates. If he teams up with his former allies in the Armenian National Congress minority opposition coalition (7 seats out of 131), some members of which walked out of the National Assembly yesterday to show solidarity with ‘Electric Yerevan', and can attract even more parliamentarians to his cause, then this scenario is certainly feasible. Additionally, ‘civic initiatives' like those protesting against the electricity hike have attracted the supportive attention of George Soros' openDemocracy network even before the current debauchery, indicating that the notorious Color Revolution-associated billionaire and his association might be playing a guiding influence over events. Like all Color Revolutions, the backers of ‘Electric Yerevan' are motivated by concrete geopolitical interests. They want to install an anti-Russian government that would withdraw Armenia from the Eurasian Economic Union and break the historical friendship between both states, following the model spearheaded by EuroMaidan's post-coup authorities. Pashinyan is highly critical of all aspects of Armenia's special relationship with Russia and has experience with anti-government organizing, hence his present designation as de-facto leader of the Color Revolution. The US also wants to drag Russia into a renewed military conflict over Nagorno-Karabakh, using post-coup newly installed nationalists like Pashinyan to aggravate the situation with Azerbaijan to the point of open warfare, which Russia, with its Collective Security Treaty Organization obligations to Armenia and its 102nd military base in Gyumri, would inevitably be sucked into. The US failed to coax a disastrous Afghan-esque military intervention out of Russia in Ukraine after the EuroMaidan events, but it doesn't mean that it won't try to do the same thing in the Caucasus after a potentially successful ‘Electric Yerevan'.